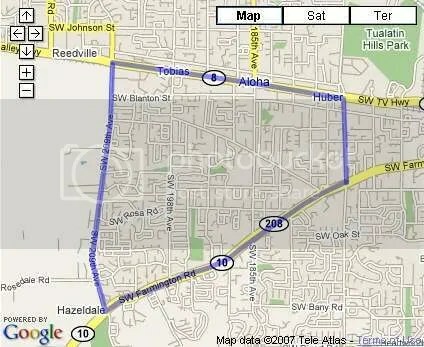 The Aloha neighborhood of Aloha, Oregon goes east from 209th to 170th and then South from Tualatin Valley Highway to Farmington Road. There are a few parks in the area including Aloha park, Butternut park, Rosa park and Hazeldale Park. As of 6/20/2008 here are the stats for the Aloha Neighborhood. This week I’ve changed the stats to only count the sales from the last 7 days to give a better reflection of what is going on in the neighborhood during any given week. For a complete list of homes for sale in the Aloha Neighborhood, please call or Click here, to request an update.